En Totenart tenemos la gama completa de Papeles Canson Infinity Platine Fiber Rag para impresión digital. Infinity Platine Fibre Rag, 310 gr., A4, caja 25 uds. Infinity Platine Fibre Rag, 310 gr., Rollo 0,61x3,05 mts. Infinity Platine Fibre Rag, 310 gr., A3, caja 25 uds. Infinity Platine Fibre Rag, 310 gr., A3+, caja 25 uds. Infinity Platine Fibre Rag, 310 gr., Rollo 0,432x15,24 mts. Infinity Platine Fibre Rag, 310 gr., A2, caja 25 uds. Infinity Platine Fibre Rag, 310 gr., Rollo 0,61x15,24 mts. 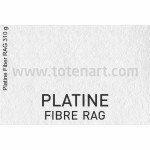 Infinity Platine Fibre Rag, 310 gr., Rollo 0,914x15,24 mts. Infinity Platine Fibre Rag, 310 gr., Rollo 1,118x15,24 mts.